All the existing URLs on our BlogEngine-based blog used both, upper- and lowercase letters, and had an filename extension of .aspx. Now Jekyll does not use filename extensions (or at least doesn’t display them) and it uses all lowercase letters in URLs. 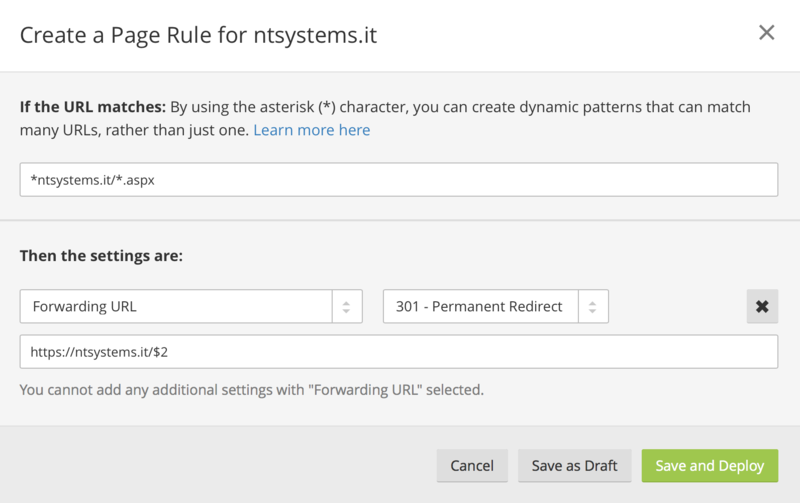 If the URL matches *ntsystems.it/*.aspx forward the request to https://ntsystems.it/$2 where $2 is the stuff that was matched by the second asterisk * in the matching pattern. Easy enough! The following setting in our _config.yml file tells Jekyll to build all posts in the /post/ directory. The title property was copied into the front matter by the script we used to migrate the posts. Quite ready, but not yet. BlogEngine used a number of .axd scripts/handlers as endpoints for things like the RSS feed, the sitemap file, or a metaweblog extension. Obviously, the /syndication.axd URL does no longer work on Jekyll, a simple /feed.xml file is used instead. I tried various redirection methods but found that RSS clients (like The Old Reader) ignored them and the feed would go dead. After some testing I found that I could create a directory with the name of syndication.axd and simply put an index.html into it. Jekyll does not show the index.html in the URL, therefore the URL would still be /syndication.axd. I copied the content of feed.xml into the /syndication.axd/index.html and, voilá, the existing RSS link continued to work. The URL of the sitemap.axd file is less important as it’s only used by search engines and not by users. So we just created a new sitemap.xml file and pointed the search engines to this new file. Additionally, we updated the Sitemap property in our robots.txt file.